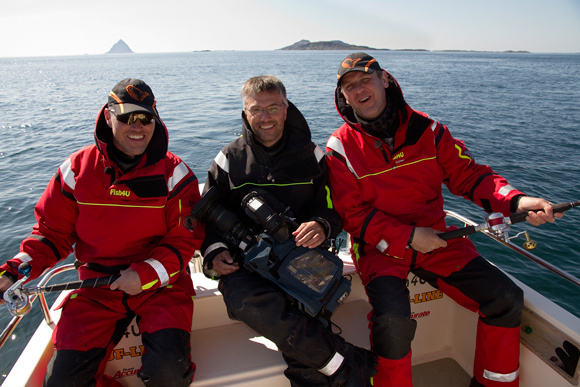 The HALIBUT QUEEN is made by Nils Arne Sæbø(middle), head of IRIS Multimedia. He is an experienced film- and tv-director, working in the natural history genre. He has directed a lot of national and international tv programs and series. Per Jonasson (left) is an experienced fishing guide who specialises in haibut. At present he works out of Tromsø in Norway, and has had one halibut world record in his boat, as well as a large number of halibuts larger than 2 meter. Kenneth Bruvik (right) is an enthusiastic (some will say a little bit crazy…) recreational fisher. He has experience from films and TV, and works as a consultant and lecturer in the Norwegian recreational fisher association. IRIS Multimedia is a television- and video-production company founded in 1995.